This post is sponsored by Easy-Off® Oven Cleaner. 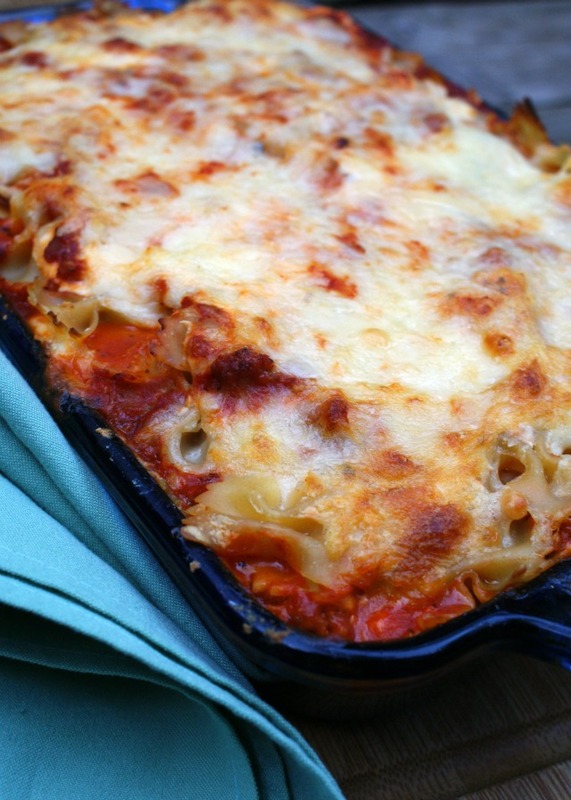 Bow Tie Sausage Lasagna is a twist on the classic Italian favorite that features bold Italian sausage and farfalle pasta in place of lasagna noodles. Sometimes cooking can be messy. There have been so many times when my kitchen looks like a bomb has gone off after I finish preparing a meal. Over the years I've gotten better at keeping the counters tidy as I cook by putting ingredients away as I use them and utilizing a garbage bowl if I've got a lot of vegetable prep to do. While I try my best to keep the countertops in order so my perfectionist brain doesn't explode due to kitchen chaos, there's one place in the kitchen where the mess is out of my hands, so to speak. That messy corner of my kitchen is the inside of my oven. Once I close the door and leave the oven to do it's work, the messes that occur during the cooking process...you know, like bubbling over pies or casseroles, dripping sweet potatoes, oozing pizza toppings...those kinds of messes? They're the ones that make my oven a mess. My oven's an old girl, but boy does she have character. 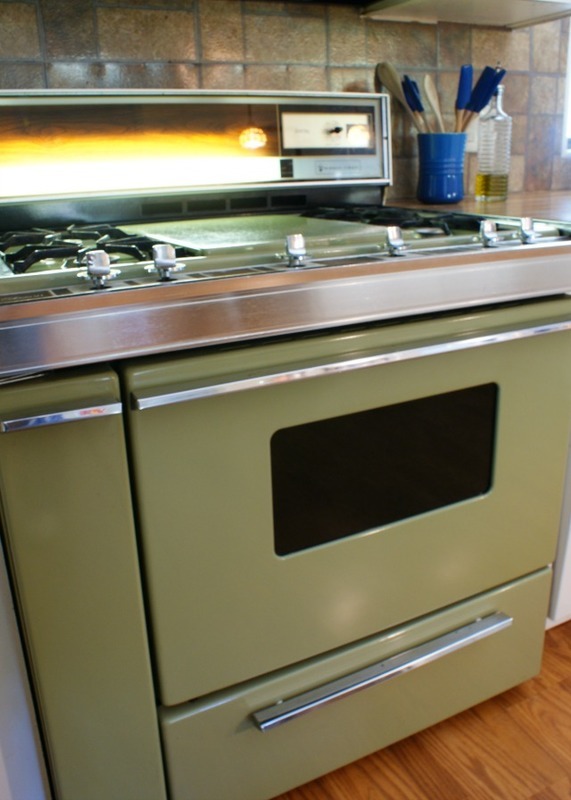 Let me introduce you to my avocado green 1979 Magic Chef oven. Ain't she pretty? We bought our home some 10 years ago and the oven came with the house. Except when we moved in, the oven was black. Painted black. Like with a paint brush. It was ugly, to say the least. We remodeled the kitchen as soon as we moved in and I decided that I'd try my hand at using some paint stripper to take the black off. I was so sure that there had to be some huge scratch or other defect underneath the hideous paint job. Because really, who paints an oven? To my surprise, underneath the paint was a shiny green beauty! The inside of the oven, however, showed the wear from 25 years of use. It was not nearly as pretty as the outside. I didn't pay as much attention to restoring the inside as I did the outside. Shame on me. Over the years I've spot cleaned here and there, but I never really got down and dirty with the built up grunge. These are my sins here, people. Don't judge. All that being said, I'm sure you can understand why, when I was asked if I'd like to try EASY-OFF® Oven Cleaner, I jumped at the chance. I have been putting off the dreaded mess for far too long. It was a sign. It was time for me to clean my oven. I decided to go with the fume free cleaner since I have kiddos and a pup in the house. I also decided to make one more really messy meal in my oven before cleaning it. Lasagna always bubbles over when I cook it, so I made a bog ol' pan of Bow Tie Sausage Lasagna (recipe below). It's meant to be baked in a 9 x 13 baking dish, but mine shattered a while back (in my oven while full of food), so I've been using my 8 x 11. That's like begging for a bubble over. And it did. A lot. If I was going to give the oven cleaner a whirl, I was really going to put it to the test. After the oven cooled, I followed the simple directions on the can and, just two hours later, I put in a few short minutes of elbow grease wiping everything down. It was so easy and, true to it's promise, penetrated through the tough baked-on oven grease without any nasty fumes! Look at the difference! There was still a little bit of lingering yucks, but I expected so much considering the state it was in when I started. Next time I'll let it sit overnight as suggested for tough messes, or maybe I'll even try the heavy duty version. Overall, I was thrilled with the results! No more will I quickly close the oven door and ignore the spills! I thought I'd be scrubbing for hours trying to cut through all the build up. And the added bonus? 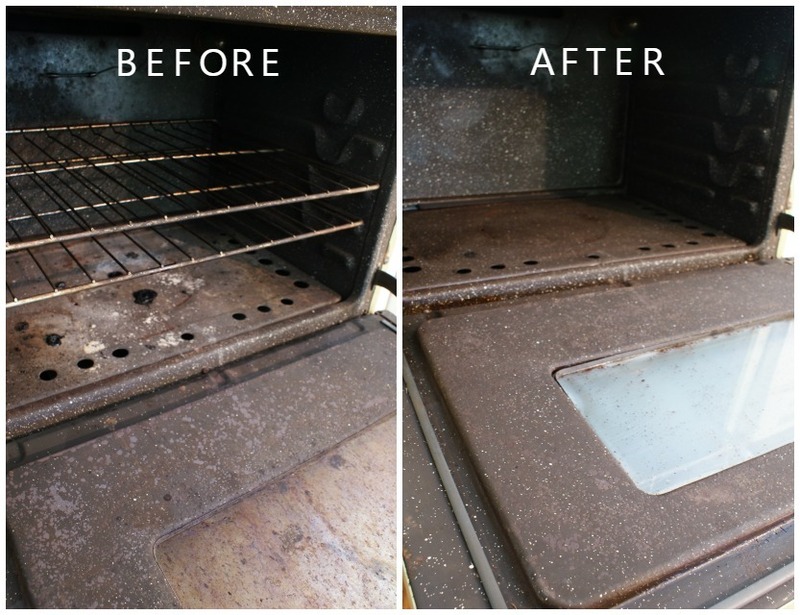 Now that it's all clean, I can use the EASY-OFF® Oven Cleaner as a spot cleaner. I'll tell ya, I'm particularly happy to have conquered my fear of cleaning the oven before turkey day. One of these days that disaster I was sporting in the bottom of my oven was going to catch fire. My luck, it would have been on a holiday. Now I don't have to worry about that! Bring on the holiday cooking. I'm ready. My oven is, too! Oh, and one more thing. 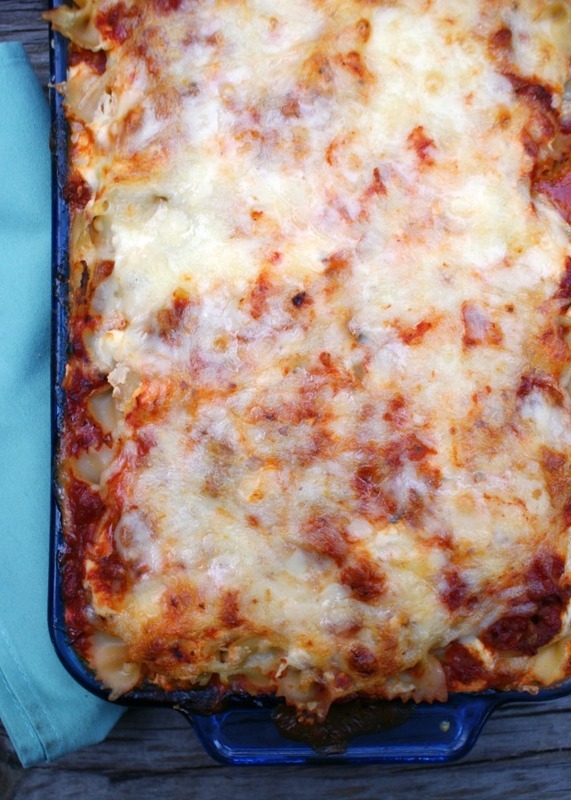 Make the cheesy, bubbly, delicious lasagna recipe. It was absolutely scrumptious. You won't be disappointed! Preheat your oven to 350 degrees. Cook the pasta according to the package directions; drain. In a large skillet, cook the sausage, onion, and garlic until the meat is no longer pink; drain off the grease. Stir in the spaghetti sauce. In a large bowl, stir together the ricotta cheese, egg, 1/2 cup of the parmesan cheese, salt, and pepper. Spread 1 cup of sauce in the bottom of a 9 x 13 inch glass baking dish. Top the sauce with 1/3 of the cooked pasta. Spread 1 cup of the ricotta mixture over the pasta and sprinkle with 1/2 cup of the shredded mozzarella cheese. Repeat the layers two more times. Sprinkle the top with the remaining 1/4 cup of parmesan cheese. Bake, uncovered, in the preheated oven for 40 minutes. Let sit for 10 minutes before serving. 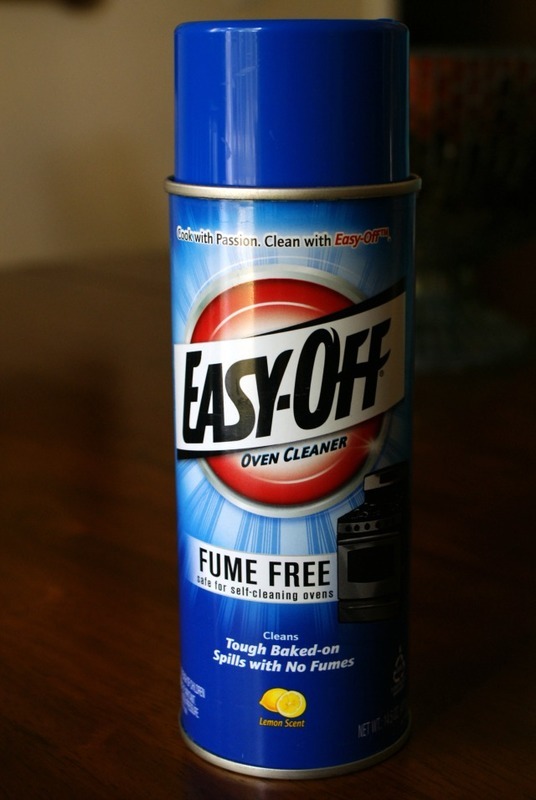 Easy-Off® Oven Cleaner is available at Walmart; Visit EasyOff.us to learn more. What type of jar spaghetti sauce do you use, plain, meat etc. I use plain, but you can use any kind you like.